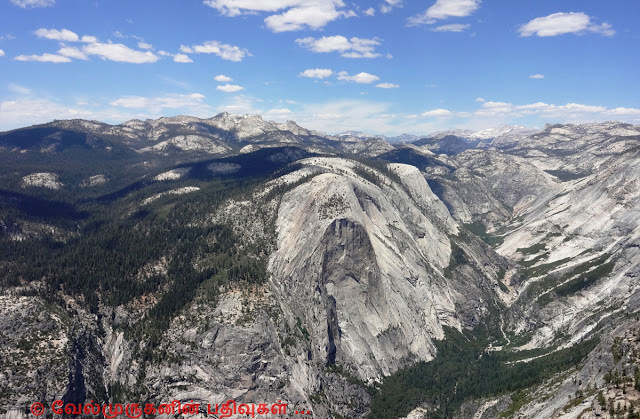 Half Dome is a granite dome in Yosemite National Park, located in north-eastern Mariposa County, California, at the eastern end of Yosemite Valley possibly Yosemite's most familiar rock formation. 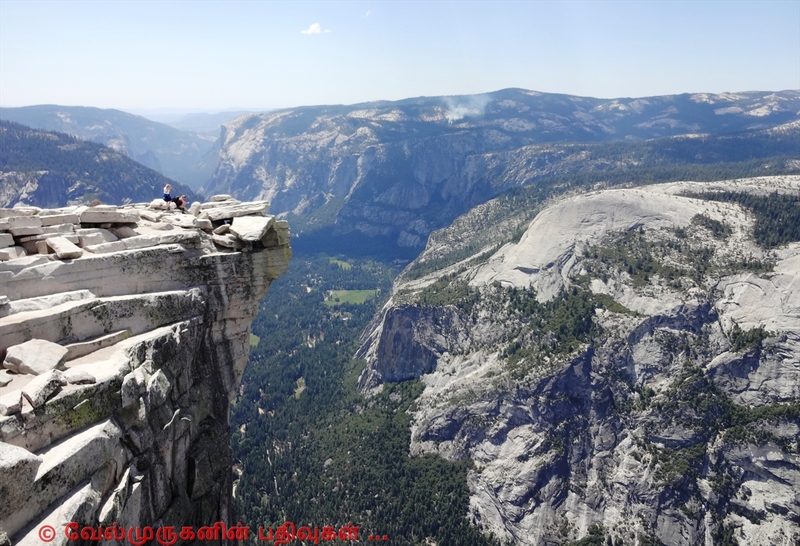 The granite crest rises nearly 5,000 feet above Yosemite Valley floor and 8,800 feet above sea level. 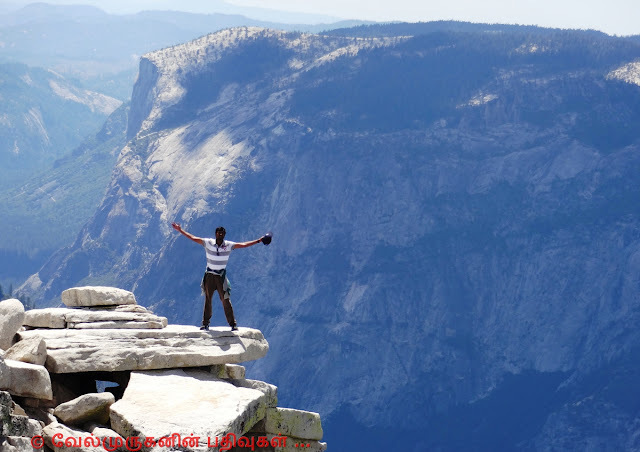 It is a Yosemite icon and a great challenge to many hikers. 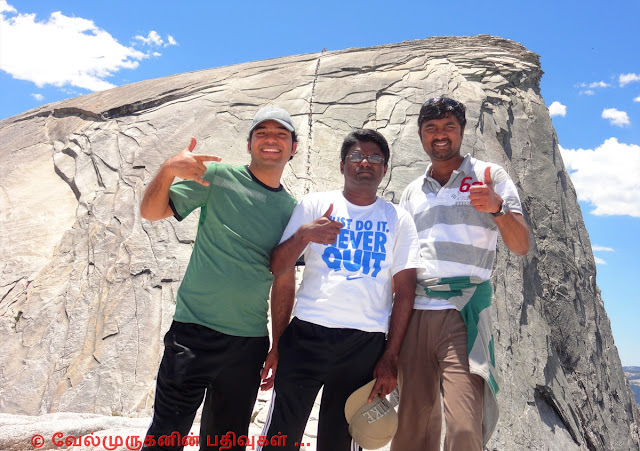 I got to know about Half dome just 3 months back (Mar-2013), from that day I got so much interested to hike this place, Finally I got the chance to be on top, on June-07-2013. 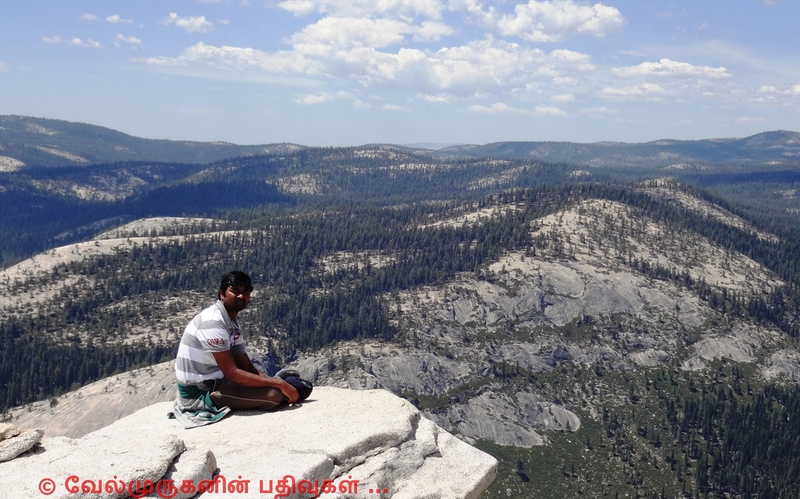 I should thank to my friends (Annamalai & Alok) without them surely I won't reached the top. To do the Half dome hike we need the proper permit. We have applied for the daily lottery on Wed(12 am), and we got selected in the lot, On Thursday Annamalai done all the pre-activities for the Friday hiking. 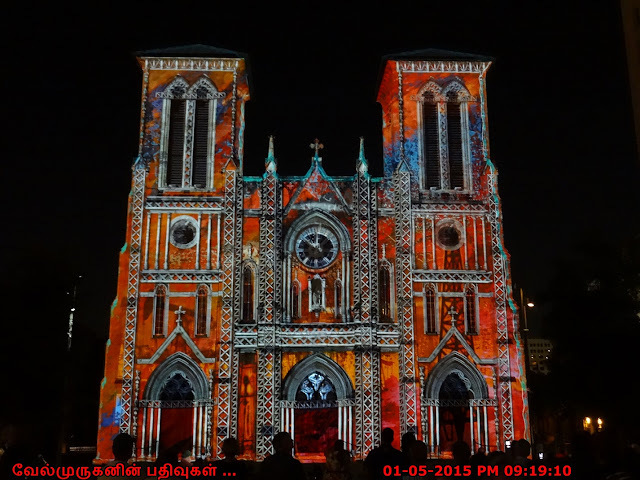 He Prepared south Indian dishes Chappathi , Potato Masala , & Chenna Masala. We have started out trip from Fremont, CA by 6pm and reached Oakhurst - Days Inn for our night stay (10 pm). We had our home made dinner and take gud sleep. Early morning 5am we started from the room after 1hr travel we reached the Yosemite Curry Village - Parking (near by YARTS shuttle stop # 16). Sharply by 6.30 am we started the dream hiking. 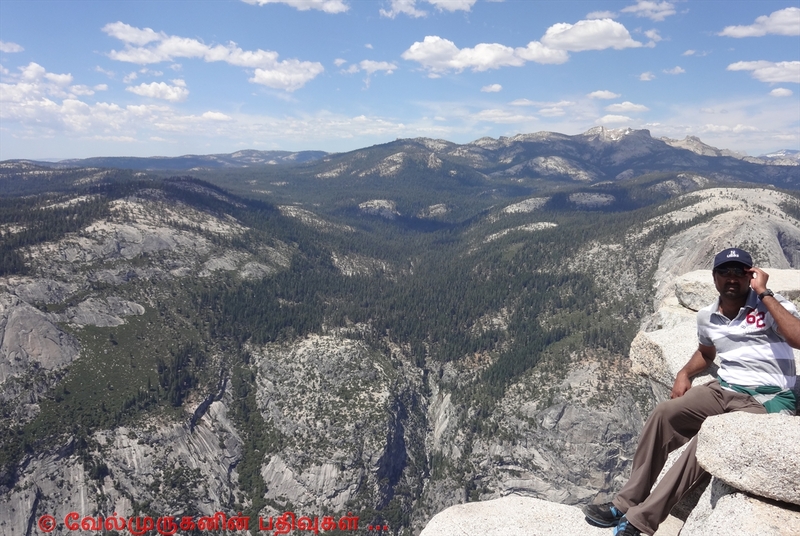 Hike Distance: 16.5 miles round trip via John Muir Trail (Mist Trail). But personally I feel it will be close to 20 miles or more. 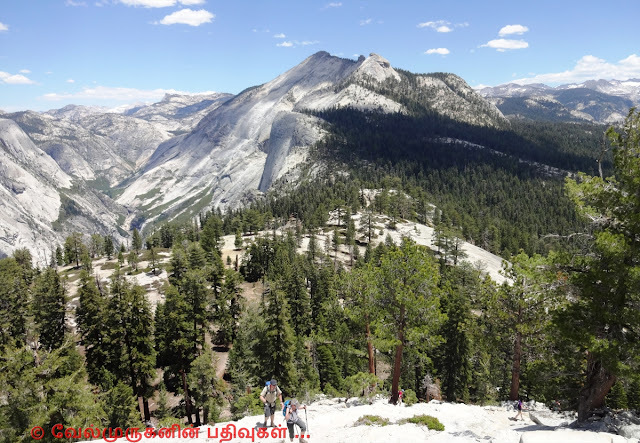 Along the way, we saw the outstanding views of Vernal and NevadaFalls, Liberty Cap, Half Dome, and--from the shoulder and summit--panoramic views of Yosemite Valley and the High Sierra. While climbing the top after few miles, I got tired and lost my energy, Even though my friends motivated not to quit and the end i reach the top by 2pm. 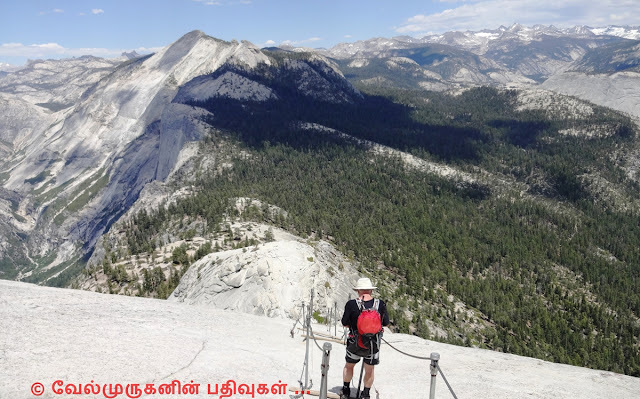 I felt very difficult when mounting up sub dome & Half dome. The "sub dome" is part of the Half Dome hike. It's not a destination on its own, although you can hike to the base of the sub dome without a permit. To proceed further to reach the half dome you need proper permission. Two rangers will be there in the base of sub dome to check the permit. Once we reached the sub dome, which got more enthusiast to climb the Half Dome, which is steep and very difficult. The last 400 vertical feet (130 meters) up the eastern slope are so sheer. Without the cables or serious mountaineering gear, the ascent would be impossible. We can find the poles holding the cables up every ten feet or so along the slope. 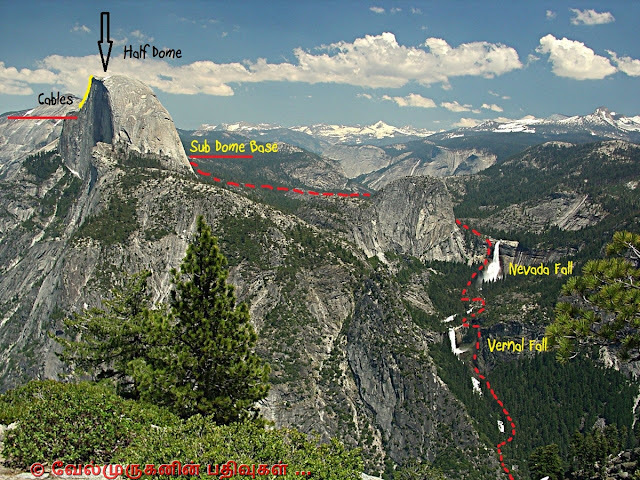 Normally it will take 10 to 12 hours to hike to Half Dome and back. But we took 14 hours to finish our hike. If you plan on hiking during the day, it's smart to leave around sunrise (or earlier) .Hikers should definitely have flashlight to avoid the struggle down the trail if dark appears. High energy foods - Bars, nuts, trail mix, jerky, candy, etc. Medicines - Pain-killer, Blister first aid, Spray for Muscle Cramp. Hand gloves with good grip. 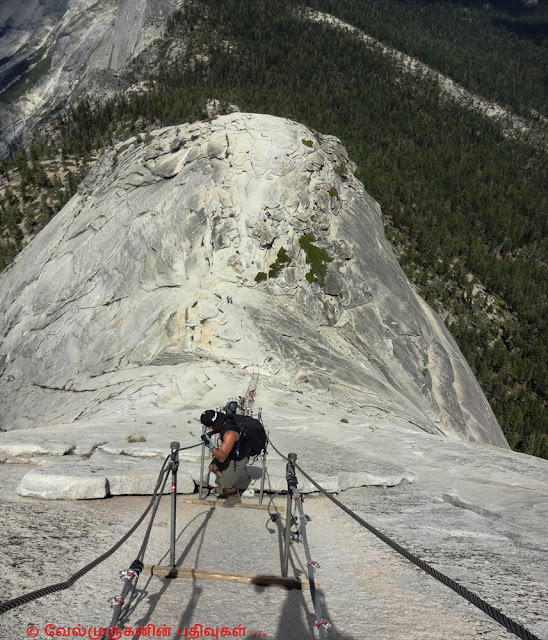 ( I saw some hikers are climbing the half dome by using outside of the cables ). Drop your hike when Storm clouds are in the area, The ground is wet (the cables and rock is more slick when it is wet. Black bears frequent Yosemite's Wilderness and are adept at grabbing backpacks from hikers and campers--during both day and night.